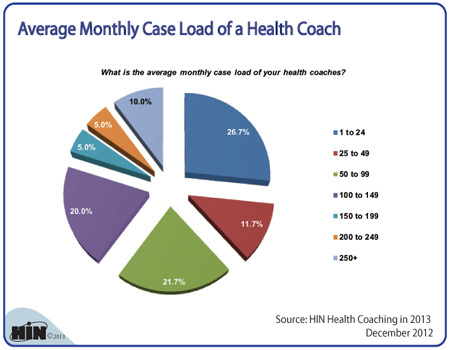 Healthcare Intelligence Network- Chart of the Week: What's the Average Monthly Case Load of a Health Coach? New Chart: What's the Average Monthly Case Load of a Health Coach? SUMMARY: Health coaching is a critical tool in population health management, helping to boost self-management of disease and reduce risk and associated cost across the health continuum. We wanted to see the average monthly case load for a health coach. 2013 Healthcare Benchmarks: Health Coaching is HIN's fourth annual collection of data points on health and wellness coaching. It presents actionable new data on overall health coaching activity, with the latest metrics on the prevalence of health coaching, program components, delivery methods, preferred behavior change models, ROI and more.